Ask fellow campers about "Crossing Creeks RV Resort (formerly Mountain View RV Resort)" and nearby attractions. 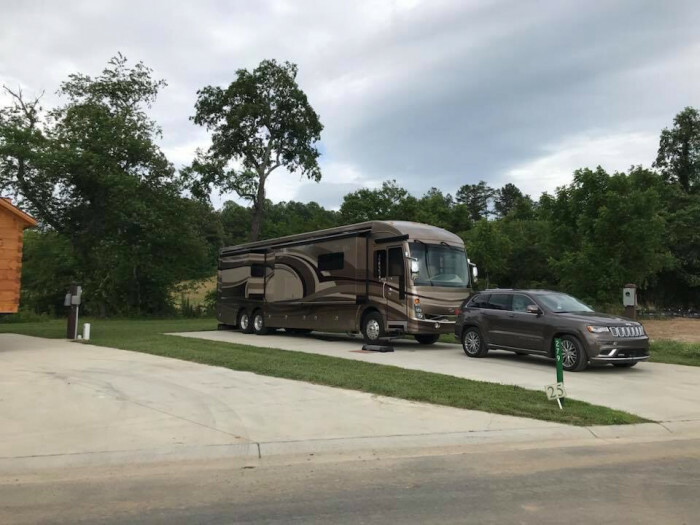 One of a KIND LUXURY RV Resort & Spa with Sweeping Mountain Views and nestled between two "Crossing Creeks" (Anderson & Coosa) Awesome people live here and they are spoiled by an AMAZING staff! You cannot duplicate what CCRV has to offer both owner and guest. Beautiful amenities: First class Clubhouse, Heated pool~Heated spa,~Spa building complete sauna, steam room,massage chairs, lounge, fireplace, showers/baths, massage therapy & facials by appointment~Fitness Center~Tennis Courts~Activities center for pool, poker, crafts, etc ~Putt Putt Golf Course~Welcome Center with full service staff...& more. I have lived here for about six months. It has been my distinct pleasure to meet and spend time with truly exceptional folks with diverse backgrounds. The owners are professionals, business owners and/or successful entrepreneurs. Anyone would be happy to live or visit Crossing Creeks RV Resort & Spa. If you love the mountains, creeks, rivers, waterfalls, hiking & walking trails, biking, wineries, fine food, small towns, waterfalls, exploring country roads and fellowship with genuinely great people...please come see what Crossing Creeks RV Resort & the North Georgia Mountain have to offer! 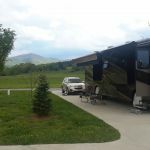 We camped at Crossing Creeks RV Resort (formerly Mountain View RV Resort) in a Travel Trailer. This park is a terrible value but has two things going for It: Great location and double wide concrete sites. The facilities are nice as you would expect, but for over $100 I would expect them to pick up the garbage. The only dumpster on the campground was 1/4 of a mile away from our site. Good separation between sites but no vegetation for privacy. I was amazed by the number of 20 foot telephone poles with ugly transformers on them throughout the park. I am not adverse to pay $100 for a campsite, but this one is simply not worth anywhere near that price. We camped at Crossing Creeks RV Resort (formerly Mountain View RV Resort) in a Motorhome. We loved this place! The amenities and activities are super and include a resort style pool and spa (spa was unfortunately not working because of a back ordered part), a fitness center with new equipment (2 tread mills, 2 elliptical, complete free weights, mats and balls, plus weight machines); a sauna, massage rooms and more. The clubhouse offers a weekly activity schedule too. The roads are paved, the sites are large and have plenty of parking space plus a large patio. Some of the units have cabins which are really nice. The only negative thing here was that there was no picnic table on the site. We camped at Crossing Creeks RV Resort (formerly Mountain View RV Resort) in a Motorhome. There are lots of festivals in the area - especially in the fall. The nearby Apple Orchard is wonderful. Parks and hiking abound, and Lake Chatuge is nearby. Super clean and spacious resort. The pool and hot tub are salt so no chlorine. Great gym, sauna and steam room. If you are trying to rough it, forget it. This place will really pamper you. The construction is a little annoying since the trucks are allowed to run freely through the park. They should have a separate entrance. However, a small annoyance... We camped at Crossing Creeks RV Resort (formerly Mountain View RV Resort) in a Motorhome. This is what and RV Resort should look like. Staff was awesome. Sites where big and level. Everything was super clean. The area is beautiful and we have already made reservations for Oct 2018. We camped at Crossing Creeks RV Resort (formerly Mountain View RV Resort) in a Motorhome. Well I'm giving them 3 stars because everyone was nice. I'll start with the good. 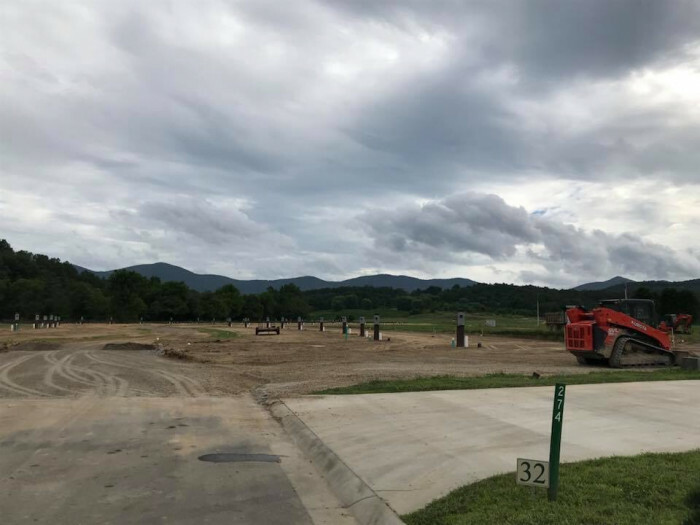 It is clean, everyone was nice, there's concrete pads, it's close to town, and it does have a lovely view (once construction is complete). Now the not so good. Concrete pad sites are not level. Maybe a few are, but the section we were in, that backed up to the creek, were not level. Speaking of the creek, it'd be a lovely view if they'd cut the weeds down around it. 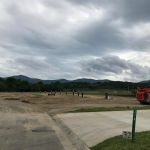 The campground is currently under expansion, and we understand that, however they should consider NOT renting the sites right up by the on going construction. The construction starts at 7am during the week. Not to mention the dirt and dust kicked up. Now our coach is well insulated, so we didn't hear the outside noise, but I'm sure some of the folks in campers and 5th wheels didn't appreciate the noise. The new sites look like they'll be very close together. There was a definite sewage smell the entire time we were there. Apparently the sites are individually sold and some have tiny houses on them and some have campers or 5th wheels with decks and landscaping around them. We never saw the pool or spa and no information was provided as to how you might schedule a massage if you wanted one. The one dog park was on the other side of the "resort" from us, in the middle of a field, and across from the dumpster. As for the dumpster, there's no trash pick up at your site. That's fine in a campground but this place is billing itself as an "RV Resort", and every resort we've stayed in offered trash pick up. In a year or two, it'll be a nice enough campground, but this is hardly a RESORT. Our site also faced west so no shade when sitting outside in the evening. We had no picnic table, many sites didn't, and a fire ring could be rented for $5 a day. Yes, they are seriously charging for a fire ring. We want folks to know what your getting when you make a reservation and it's NOT an RV Resort experience. We camped at Crossing Creeks RV Resort (formerly Mountain View RV Resort) in a Motorhome. Check out Jim's Smoking Q. Terrific BBQ. Only open Thurs - Sat. Nani's deli in downtown was also very good! Cuban food. The rate actually reflects the monthly rate of $1177 tax included...about 40 a day. I think the regular rate is $70 per night, but don't let this scare you off because it is the nicest park we have stayed in ANYWHERE, and we have been in most states in America. We almost didn't stay here because there are other places about half the price, but you get your money's worth here! Everything is top notch, and we have enjoyed the Meet and Greets and the potluck dinners. I'm not even going into detail about the rental sites because they're complete with the exception of no tables. That was the only thing we wish they did have. The Clubhouse is beautiful, and the Fitness center is the best I've been to in any RV park, including the sauna and steam room, massage rooms, massage chairs, etc. The pool is heated and very nicely landscaped. It's true that on weekends there are some kids using the pool, but in general it's adult campers enjoying the pool and hot tub. The wifi is very good and TV is good too, except you do have to get the receivers and cords and run them through a window, but that's no big deal...lots of channels. There are a lot of owners and work campers, but they are ALL the friendliest bunch of people we've encountered. We did not intend to consider buying a lot, but are giving it some serious thought! We plan on coming back in October for another month! 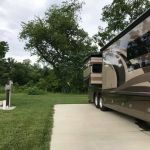 We camped at Crossing Creeks RV Resort (formerly Mountain View RV Resort) in a Fifth Wheel. Bring your motorcycle because there is some of the best bike riding nationwide right up here. Lots to do, waterfalls, hiking (near the Appalachian Trail where we hiked the entire "width" of the trail- that's a joke, width, not length. :-). ) Close to Blue Ridge that has tons to do, including the Blue Ridge Scenic Railway. We stayed a week at Crossing Creek. Nice wide concrete pads and long enough for most class A's pulling a toad. WiFi was good but spotty. 5mps and 2mps upload. Cable was a box with a cord you ran through an open window so we didn't use it. Small pool and spa was nice except for the kids with the float tubes on the weekend, pool is to small for that. Very friendly staff and great landscaping around the buildings. Crossing Creek is an owner park with lots for sale. Phase two is going in now with lots around 70k. We camped at Crossing Creeks RV Resort (formerly Mountain View RV Resort) in a Motorhome. Fantastic area and weather. We had temps from 66-81 during our stay with low humidity. Temps in Houston were hitting 100 so this was like heaven. Park is beautiful with fantastic mountain views and 2 creeks that run on both sides of the park. Just starting phase 2 of the new development by the new owners. Making it a super nice owner park like a 55+ place with those type of activities. Great food and sites to see close by. Has fast internet to stream with and good HD cable. Will be back. We camped at Crossing Creeks RV Resort (formerly Mountain View RV Resort) in a Motorhome. Pick you spot for a northern direction to get the best shade. Trees are young and not much shade yet. Brasstown Bald mountain is a must see. It's about 20 mins of breathtaking drive and about a 15 degree change when you get to the top. Quaint town square with excellent food all around. If you're looking for a park where you can become one with nature and rough it for a bit, move along now. 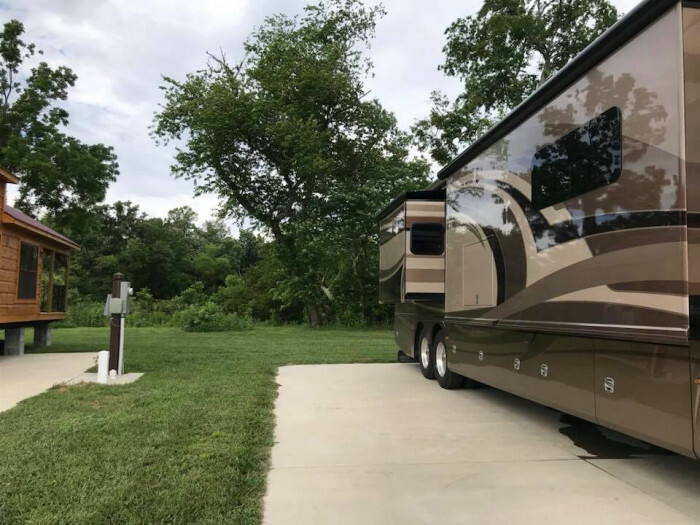 If you're looking for a beautiful park close to the beaten path with excellent amenities and attention to detail, this may be the place for you. This is probably the nicest, cleanest and well thought out park we've been to yet. The heated salt water pool, while not huge, never seemed to be overly busy despite the fact that we stayed over the Independence Day weekend. The hot tub adjacent to the pool was very clean and spacious enough for at least eight people to enjoy comfortably. The pool area itself was spotless as were the shower and restroom facilities nearby. If swimming isn't your thing, there is also an activities center complete with a billiards table and a shuffleboard table, various crafts areas and a spa complete with workout equipment, a steam room and massage chairs. There's more stuff, but at the risk of sounding like I'm selling their lots (I'm not) I'll leave it to you to peruse their website. The folks on-site were very friendly and helpful. We were wandering from area to area and were greeted several times and offered assistance if needed. Our site was spacious but not huge with a level, very smooth, concrete pad. The hookups were convenient and worked as they should. I did not test their internet service although wireless is available throughout the park, but Verizon data and voice service worked wonderfully. Satellite TV should have no issues here as the trees around the sites haven't grown to any real height yet. The only negative we could come up with was the lack of a picnic table at our site - none of the sites seemed to have them. There were no fire pits provided either. While the lack of a campfire didn't detract from our stay, it would have been nice to at least have a picnic table to enjoy a meal on. We camped at Crossing Creeks RV Resort (formerly Mountain View RV Resort) in a Motorhome. Loads of activities planned by the folks here so there's always something to do. Groceries can be had at the Ingles in Blairsville. Try Mike's Seafood for great fresh fish during the week - but get there early. This place is under new name and mgmt and is much improved. Great for 45' rig. Level sites. We camped at Crossing Creeks RV Resort (formerly Mountain View RV Resort) in a Motorhome. 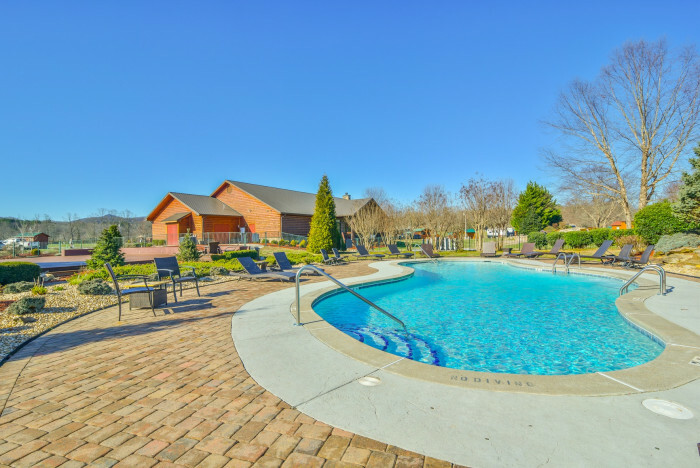 Wonderful amenities - pool, hot tub, spa services available, massage chairs, clubhouse, planned activities, etc. Common areas are beautiful and spotless, landscaping is gorgeous - fountains and waterfalls plus manicured lawns and plantings. Big concrete sites but no shade. Staff extremely helpful and friendly. Excellent wifi and cable TV and satellite reception should also be great. BYO tables & chairs. Fire rings and tricycles can be rented. Small dog run but we were next to huge open field where we took our dogs. All 4 were welcome. 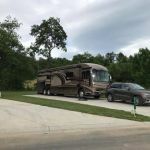 We camped at Crossing Creeks RV Resort (formerly Mountain View RV Resort) in a Motorhome. Water pressure not great. This resort will be in the path of the 2017 eclipse, and we are booked for it. Alexander's store is a don't miss. Ingles is one of the best grocery stores I've ever seen (and I've seen a bunch!) Cabins also available to rent and purchase, as are the lots. We are considering. This is a beautiful spa and RV park. You can buy sites or rent. We rented but had full use of sauna, steam and fitness. Scenery was awesome and is very quiet and peaceful. Will go again and may even purchase a lot in the future for retirement. 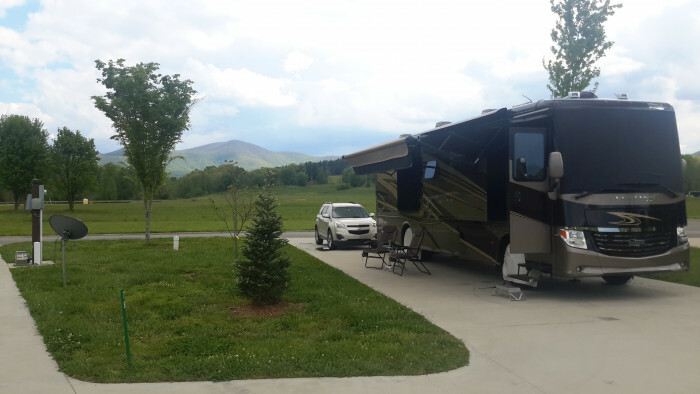 We camped at Crossing Creeks RV Resort (formerly Mountain View RV Resort) in a Fifth Wheel. Helen and Blue Ridge are only 22 miles away...either direction..and Hiawassee is about 19 miles. Blue Ridge, town, waterfalls, rafting in NC. So much to do, eat at local restaurants, the food is great. The Ingles grocery is possibly the largest grocery store I've ever been in. Blue Ridge is about a half hour away and is a nice day trip. We rode on the Blue Ridge Railway and took in Brasstown Bald Mt. there is a restaurant in Blairsville named the Hole in the Wall and they served a good breakfast and very good price and friendly. Several grocery stores, fast food, WalMart and Home Depot close by. Make time to go to Brasstown Bald, highest point in Georgia. Gorgeous! The town of Blairsville is about 3 miles away and has many nice restaurants, grocery stores and other amenities. We went to attend a BBQ and Blues Festival in nearby Blue Ridge, Georgia, which was a blast. We also visited nearby apple orchids and wineries. This area is kind of the central part of the North Georgia Mountain wine country. 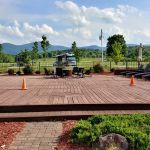 Lots of good casual local restaurants in Blairsville, including on and near the Square. Go to BrassTown Bald (highest elevation in GA), "Back in Time on 129" place on US 129 just south of Blairsville, and trendy small town of Blue Ridge about 20 mi W of Blairsville on US76. Are you affiliated with Crossing Creeks RV Resort (formerly Mountain View RV Resort) ?